Koch Industries is a fossil fuels conglomerate with estimated revenues of more than $100 billion annually and 130,000 employees spread around the globe. It’s one of the largest, private corporations in the world with a history of funding nonprofit front groups and political candidates who are climate change skeptics. Typically, political payments go in one direction from this behemoth: from the Koch Industries Super Pac (KochPac) to Republican political candidates or political committees. Now, quietly, political payments are going in both directions, effectively creating an Orwellian campaign finance model. The propriety of a multinational industrial conglomerate with an anti-regulatory agenda having a stranglehold on a highly sophisticated voter dating mining platform with unlimited funds to hire Ph.Ds., statisticians and computer scientists trained in artificial intelligence and machine learning, has yet to enter the national discourse. In the April 1, 2017 issue of the company’s Discovery Newsletter, Charles Koch, Chairman and CEO of Koch Industries, owned up to owning i360, writing that “Thanks to the acquisitions of Molex, EFT, Infor and i360, we now have better information and systems than we’ve ever had in the history of the company.” Charles Koch declined to answer our emailed request to clarify when Koch Industries purchased i360, but Koch Industries is currently running help-wanted ads for database engineers and data scientists to assist i360 in the 2018 election. According to LinkedIn’s roster of existing i360 employees, Koch Industries already has plenty of highly skilled coders and tech professionals in various geographic locations around the country. There may be synergies between i360, EFT Analytics and Infor. The website for EFT Analytics states that it “combines powerful advanced analytics software with your experienced process engineers” while allowing you to be “predictive and actionable in real time.” According to Infor’s website, one of its products is Birst, which was built with “patented technologies,” and “puts the power of analytics in the hands of every information worker and dramatically accelerates the process of delivering insights across the enterprise.” A division of Koch Industries invested over $2 billion in Infor in February of 2017. The EFT Analytics acquisition came in 2016. Terms were not disclosed. From February 13, 2017 through May 22, 2018, the Massachusetts Republican Party paid i360 more than $25,000 for voter data management services. The Republican Party of Wisconsin, the Nevada Republican Central Committee, the Montana Republican State Central Committee and dozens of Republican candidates have paid i360 tens of thousands of dollars for assistance in the 2018 midterm elections. FEC records designate the services paid for as everything from digital and TV placement of ads, to software, to research and phone calls, to voter data modeling, to building campaign web sites. Senator Chuck Grassley’s principal campaign committee wrote out a check to i360 for $6,269 on January 12, 2017 for “campaign voter data.” Grassley was re-elected to a new 6-year term in 2016 and Chairs the Senate Committee on the Judiciary. That committee conducts confirmation hearings for all Federal judges, including those for the U.S. Supreme Court. It also holds confirmation hearings for the U.S. Attorney General, Deputy Attorney General and all U.S. Attorneys throughout the United States. The largest single disbursement from a political committee to i360 came from Freedom Partners Action Fund, a Super Pac. On June 26, 2018, the Super Pac wrote out a check for $1,520,592 to i360, designating the funds for “media placement-broadcast/cable, digital & survey research.” According to the Center for Responsive Politics, the largest donor during the current election cycle to the Freedom Partners Action Fund is Charles Koch’s Trust, which has donated $3 million. Since 2014, Charles Koch and his trust have given $14 million to the Freedom Partners Super Pac. This raises the question as to whether Charles Koch, a multi-billionaire, is subsidizing the work of i360. 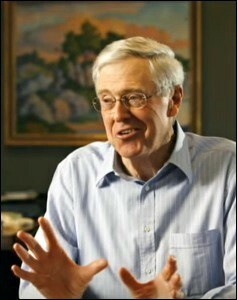 Charles Koch, and his brother David, are majority owners of Koch Industries. Forbes puts their net worth at $53.5 billion each as of August 12, 2018. That warning might have more bite if the RNC itself had not assisted in i360’s rise to power. The RNC signed data sharing arrangements with i360 for both the 2014 and 2016 elections. That was, however, when i360 was reported to be part of a tax-exempt group set up by the Koch donor network — the Freedom Partners Chamber of Commerce, now shortened to just Freedom Partners, which is also associated with the Freedom Partners Action Fund, the Super Pac. The Freedom Partners/Koch network played a major role in the 2016 election and was quick to demand that its agenda be implemented in the Trump administration. In January 2017, it released a formal memorandum of those demands, many of which have now been implemented by the Trump administration, including the withdrawal of the U.S. from the Paris Climate Accord. One i360 employee profile listed at LinkedIn suggests that Koch Industries plans to innovate further in the field of data and information management. A Senior Data Analyst employed at i360, Carter Fawson, says he is simultaneously working at a company he founded, Eliot LLC. The demo for Eliot LLC says it uses artificial intelligence to deliver a truthfulness and accuracy score to news articles. The article that the Eliot demo has chosen to critique is a Washington Post article that Eliot did not feel was fair to Charles Koch.